Immediatly removes chlorine from the pond making water safe for plants and fish. One ounce dry Vanish™ treats 5,600 gallons. 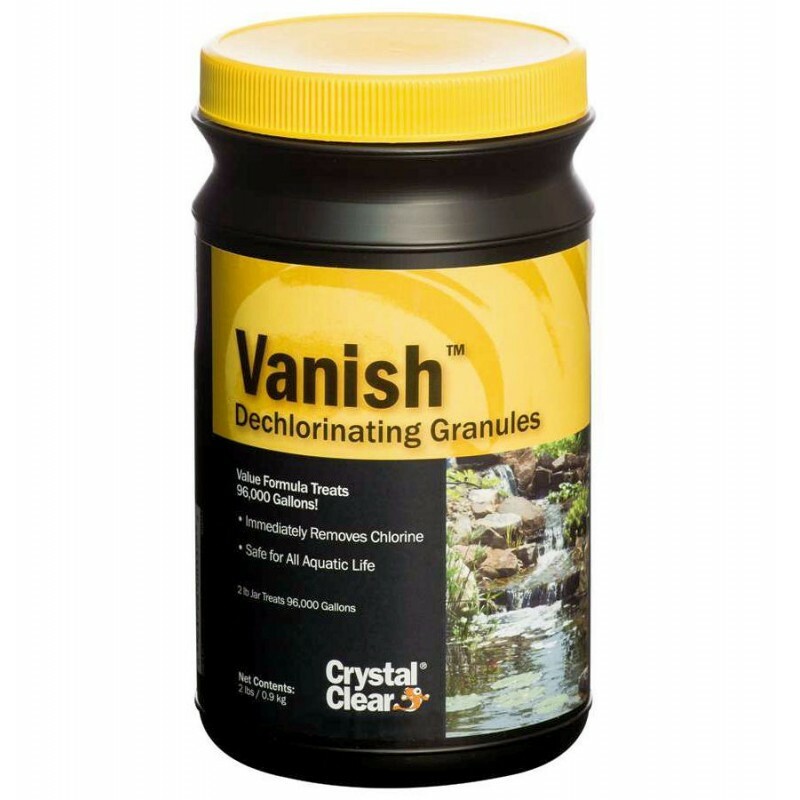 CrystalClear Vanish Dry Dechlorinator will immediately remove chlorine that is present in city water supplies. Chlorine and chloramine are substances added to most city s water supplies to make water safe for human consumption. Chlorine and chloramine are toxic to all pond fish. Left untreated these substances can thicken gill filaments and cause gill lesions to develop leaving the fish unable to breath. For best results apply CrystalClear Dechlorinator to the area of the pond with the most circulation. This will allow the product to be dispersed throughout the entire water column. Apply Vanish™ at the rate prescribed after new pond has been filled. After 20 minutes pond water will be safe for fish and plants to be added. Apply Vanish™ at the rate prescribed when performing a water change or refilling evaporated water. When adding Vanish™ during a water change it is safest to fill buckets of tap water and apply the correct application for the number of gallons the bucket holds. Stir water in the bucket and dump treated water into the pond. 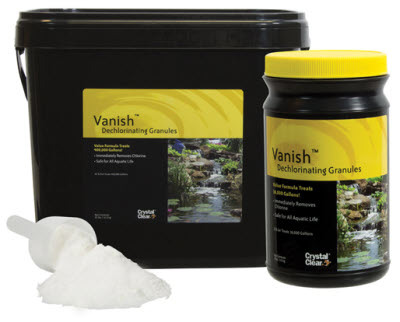 Apply Vanish™ to an area of the pond with the most circulation to ensure the product will be dispersed throughout the entire pond. Vanish™ only removes chlorine. Do not attempt to use Vanish™ as a fish medication.